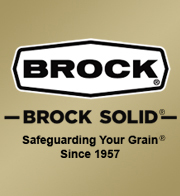 The revolutionary design of Brock's unique TRI-CORR® Silo Aeration Flooring System makes it one of the strongest floors in the industry. Plus, it includes the best features of Brock's popular silo aeration floors to offer even air distribution and easy silo clean-out. The patented Brock TRI-CORR Floor System can be used in silos ranging in diameters from 3.7 to 27.4 m (12 to 90 feet) and up to 33.5 m (110 feet) in eave height. Brock named the floor TRI-CORR because of its distinctive triangle-shaped center leg and its strength-providing corrugations on the floor's surface and legs for added stability and long life. Increases the overall strength and offers three times more support at the floor's crown compared to previous Brock aeration floor designs. Features a unique, triangle-shaped center leg reinforcing the center of the floor plank to help give the floor extraordinary strength and rigidity. Provides a flat floor plank for easier bin sweeping and grain clean-up operations. Designed so the plank and the floor support perform as a unit, standing up to the stresses of repeated loading and unloading. Handles normal operating loads imposed by most stirring devices. Floor planks nest together more tightly, making the floor plank bundles more stable and easier to handle during shipping and installation. Retrofits with all previous Brock aeration floors. With its innovative, strength-giving, modified “M”-shaped profile, every Brock TRI-CORR System floor plank measures 178 mm wide x 38 mm deep (7 inches x 1-1/2 inches). Brock's TRI-CORR Floor profile adds a unique middle support leg to the floor plank to provide a third weight-bearing point. Other floors use only two. This pioneering design gives tremendous strength to Brock's floor for bridging between supports and for transferring the weight load from the plank to the floor support. Roll-formed from high-tensile, galvanized steel, all Brock TRI-CORR Floor planks feature clear-punched holes providing ample open area for even air distribution and movement, as well as allowing easy, complete clean-out of the silo. To accommodate various sizes of grain, hole size options include openings that are 1.3 or 2.4 mm (.050 or .094 inches) in diameter.